A Canadian man received a $162 ticket last week for flashing his lights, and honking his horn at a police officer who was breaking the law. 69-year-old Michael Reilley had regularly noticed people making left turns through a dangerous intersection where left turns were not allowed during high traffic hours. This had always bothered him, but when he saw a police car do it, he was more annoyed than usual. 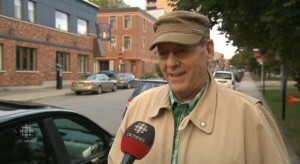 “I was immediately annoyed because I didn’t expect that type of behavior from police,” Reilley told CBC News. Reilley said that he was immediately motivated to take action, and was close enough to the police car to safely intervene. Reilley pulled up behind the car and began flashing his lights, when that didn’t get their attention, he began honking his horn. Finally, the police car pulled over, and Reilley was able to tell the officer what had just happened. When he informed the officer of their error, they were shocked that he would even think to pull them over. The officer than took Reilley’s ID and ordered him to get back into his car, he refused and moved to the sidewalk to photograph the police car. Much to Reilley’s surprised, the officer returned with a $162 ticket. “They fined me for honking my horn to bring to their attention to something that they had done illegally. And I find that an abuse of power.” he said. “They could have said ‘Oh, thank you for bringing that to our attention, we’re sorry.’ But no, they had to play heavy, they had to show that they were boss,” he added. Reilley is among a growing number of people around the world who are beginning to speak out about police corruption. Reilley is upset about his ticket but does not regret his decision at all, in fact, he encourages others to do what they can told police accountable in situations like this one. “Police going through stop signs, going through red lights without their flashers on… Police are not above the Highway Safety Code. We are their bosses. Their job is to serve and protect only, not to harass and do what I experienced,” Reilley said.